Seen upon the ground, the dark bird is scarcely attractive with his clumsy beak overbalancing a head that protrudes with stupid-looking awkwardness; but as he rises into the trees his lovely rose-colored breast and under-wing feathers are seen, and before he has had time to repeat his delicious, rich-voiced warble you are already in love with him. They’re back. 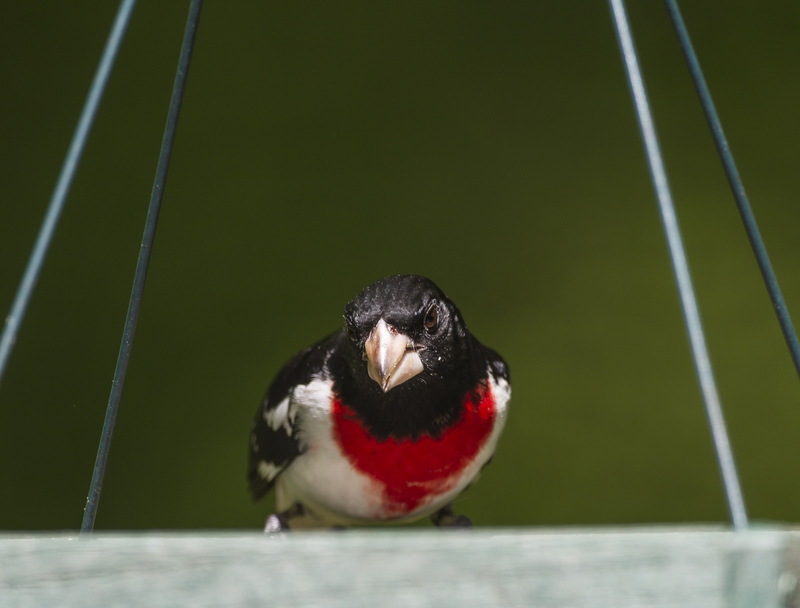 Last Friday, April 22, I saw my first rose-breasted grosbeak at the feeder. Later in the day, there were three males at the feeder (and me with no camera handy). This is a few days earlier than I have seen them the past couple of years. 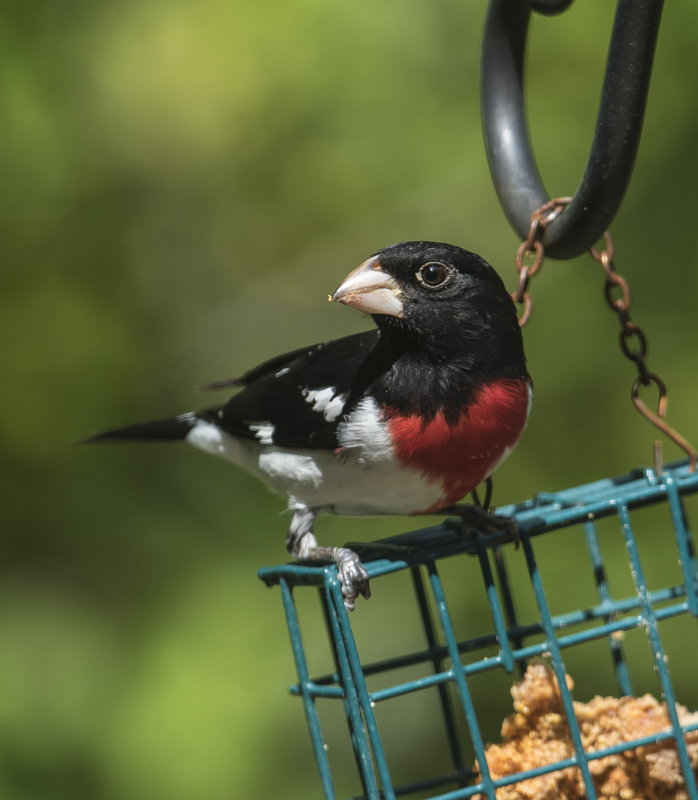 Definitely one of my favorite spring migrants, the male rose-breasted grosbeak is certainly one of the most colorful birds to spend time at our feeders. 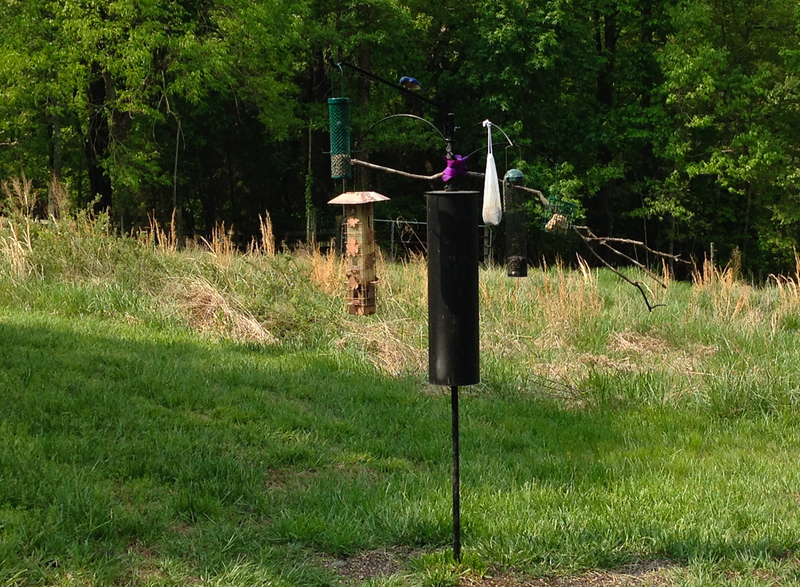 They seem to prefer the open, platform-style sunflower feeder, but also visit the suet feeder with regularity. You can tell they are a favorite of mine, since I seem to post blogs about their arrival each season. 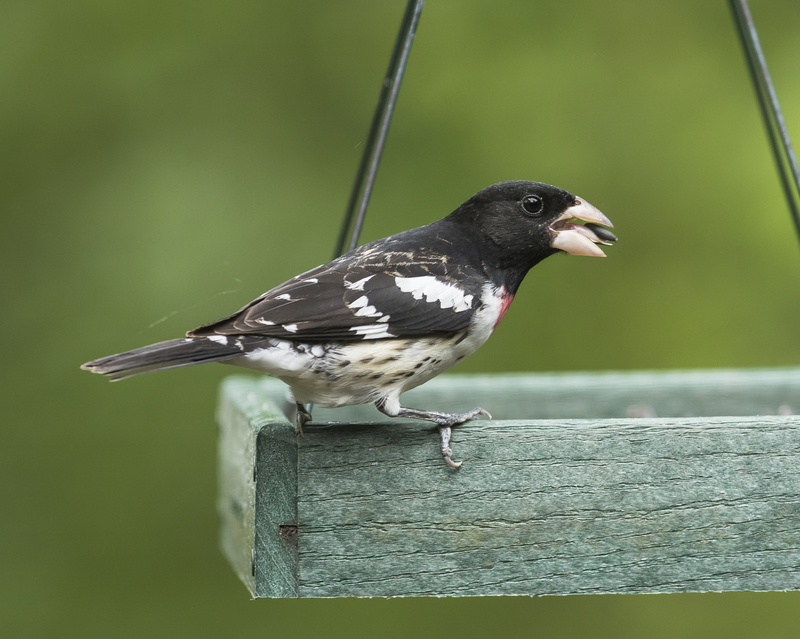 I suppose it is a combination of things that make them so appealing – they are regular visitors at the feeders, they tend to stay at feeders for longer periods of time than most birds, they are relatively large with what seems to be an over-sized beak, and they have a stunning color combination. Add their melodious song, and you have a bird to remember, and one to anxiously wait for each spring. First to arrive from their wintering grounds in Central and South America are the colorful males. The brownish females will be along in a few days. Together, they will snarf up sunflower seeds for a few weeks, and then be gone by mid-May, on their way to breeding grounds farther north, or in the higher elevations of our mountains. Even if I had not seen all three birds on the feeder at once, I would know there are at least three in the yard, based on differences in their plumage. 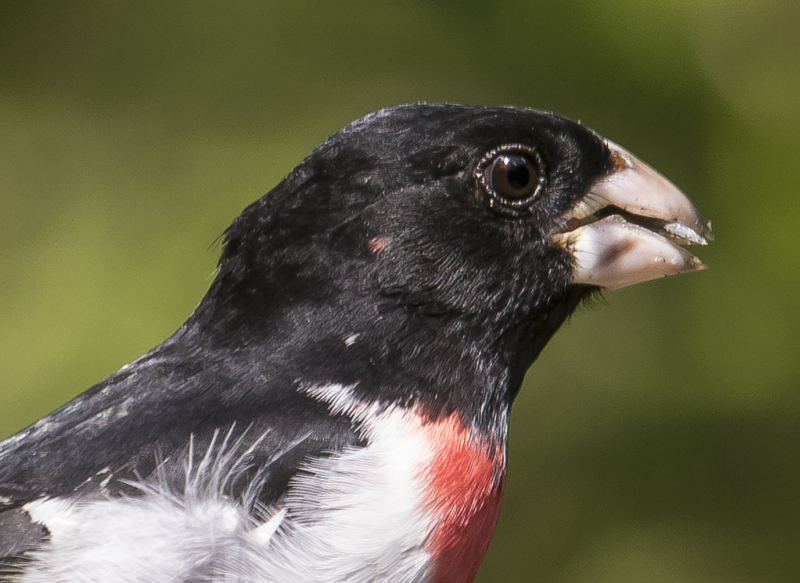 Supposedly, you can see subtle differences in the shape of the rose-colored patch on individual males, but these guys also differ in the amount of speckling on their breast feathers. Granted, pictures of birds on a feeder are not my usual thing, but the feeders near the window are suspended on a pulley system out beyond the deck, making it more difficult to position branches and other natural posts for the usual “bird on a branch” photo at feeding stations. I owe all this to the incredibly abundant and pesky squirrels that share these woods (where is the red-tailed hawk when you need it?). The good news is that the birds are close enough to the windows to allow great views to appreciate their subtle differences and beauty. And, it is a definite perk to be sitting here with a cup of coffee, typing on the laptop, and looking out at the roses in the yard, even if it is for only a few weeks. What strong colored fellows, black, white, and fiery rose-red breasts! They’re back…it will only be for a couple of weeks, but I will enjoy every minute of it. 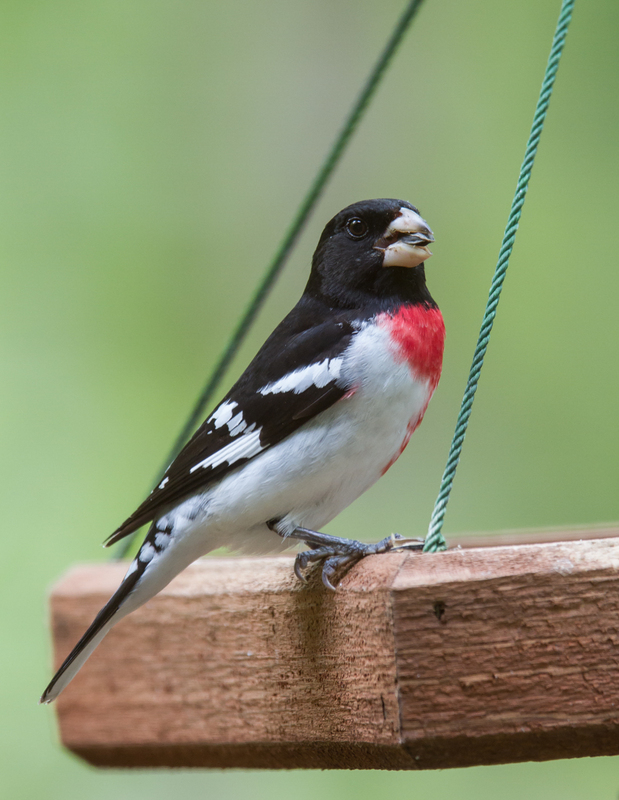 Saturday morning, I saw my first Rose-breasted Grosbeak of the season. Uncharacteristically, it was a female (males usually arrive first in their travels north in spring). Sunday was the first male, and every day this week there have been several (mostly males) stopping at the platform feeders to snarf sunflower seeds. 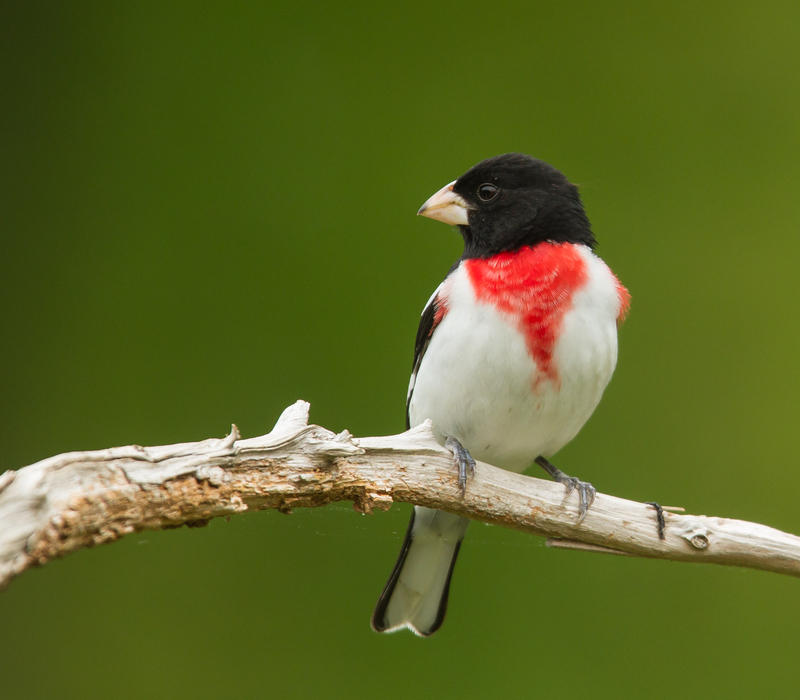 The males are certainly one of our most glorious birds, both in song and color. 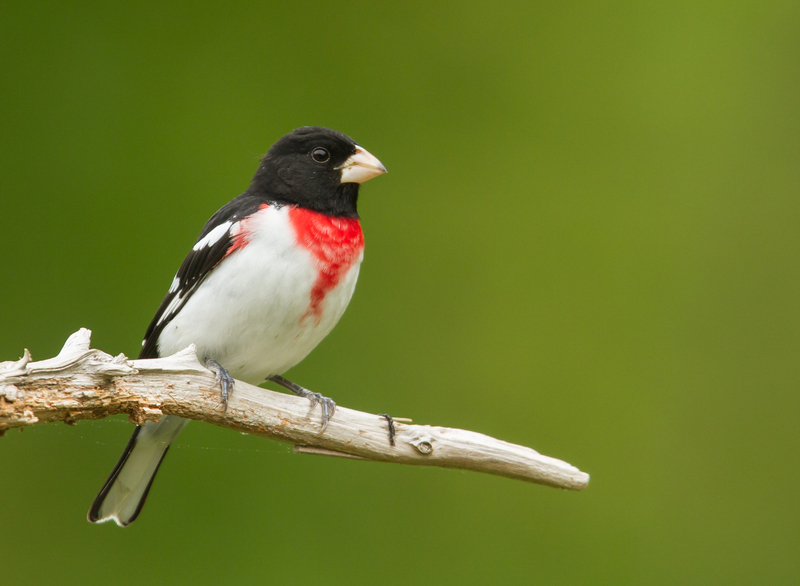 Thoreau believed that Rose-breasted Grosbeaks were our richest singer, perhaps, after the wood thrush. They sound like a melodious robin in song. But, to me, it is their bold, contrasting color pattern that make them such a joy to observe as they pass through on migration every spring. 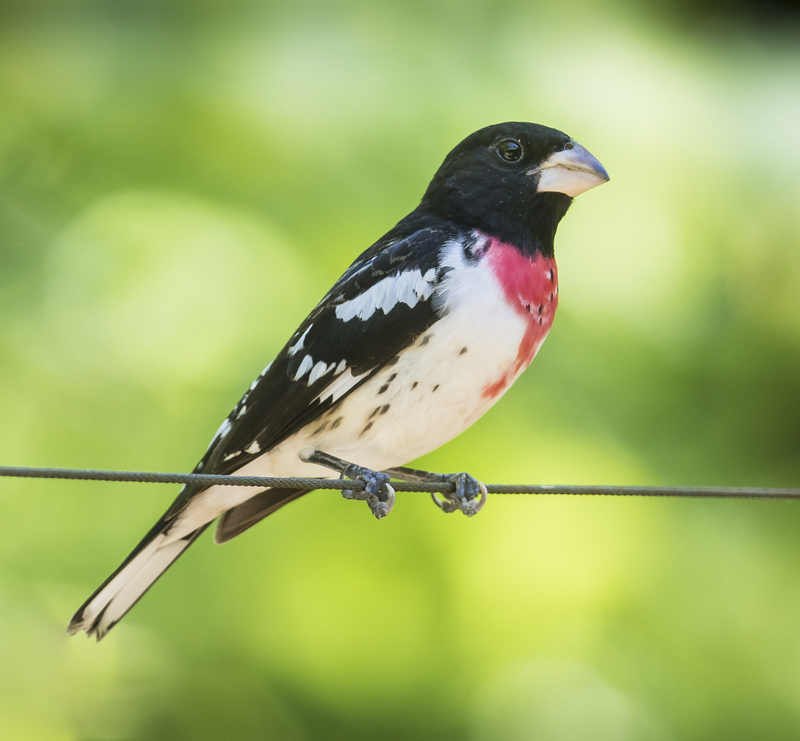 Mature males are vividly marked with black and white, offset by a bright rose-colored breast patch. 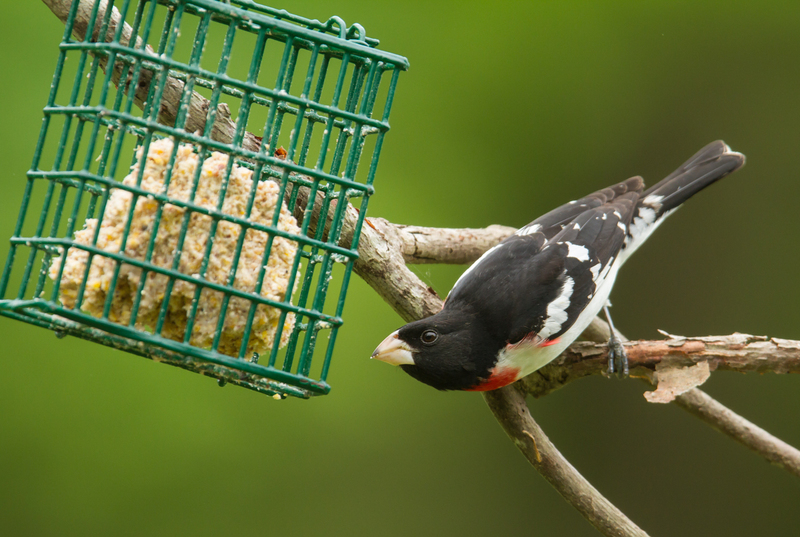 That patch can be quite variable from one male to the next, and can be used to identify individuals coming to your feeder. Females are brown and streaky with a bold white eye-stripe. They should be around for a few weeks, before continuing on to their breeding grounds further north and in our mountains. They winter in Central and South America, feeding in small flocks on fruit and insects. It always amazes me how they seem to migrate in a wave, with records of first sightings popping up on the internet all over the North Carolina last week. 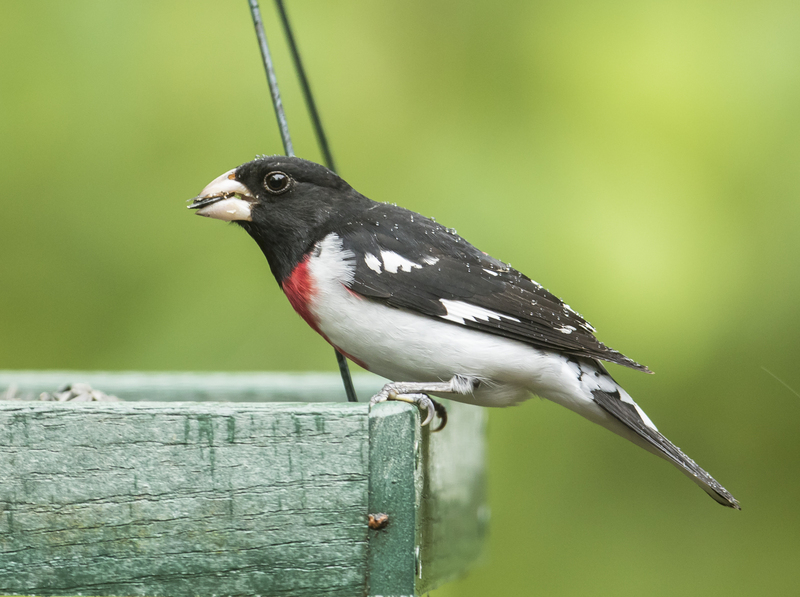 Last spring, I enjoyed some great photo opportunities (see Garden Birds – Rose-breasted Grosbeak) as a few males were feeding at a suet feeder out on the power line, which provided much better lighting conditions than the shade around the house now. Here is a photo from the archives under those conditions. Many other species are also passing through or setting up territories in my woods right now. In addition to the usual suspects like woodpeckers, doves, chickadees, cardinals, and titmice, these past few mornings we have seen or heard the following: Northern Parula Warbler, Black-throated Blue Warbler, Worm-eating Warbler, Black-and-white Warbler, Hooded Warbler, Yellow-throated Warbler, Yellow-throated Vireo, Red-eyed Vireo, Blue-headed Vireo, Summer Tanager, Scarlet Tanager, Acadian Flycatcher, Ovenbird, Wood Thrush, and a Veery. It is certainly a great time to get outside and look up. Perhaps he meant to say… one attraction in retiring was that I should have leisure and opportunity to see the spring come in. I have lived in the woods for many years and always marveled at the arrival of spring, but it has always flown by into the heat and dark greens of summer too quickly. It seems I have never had the time to really watch it, to see its daily, sometime hourly, subtle shifts. I am cherishing it this year. The early spring wildflowers have peaked here in the Piedmont, but now is the time for the birds. I spent a couple of hours Sunday morning with friends walking the trail at Mason Farm Biological Preserve in Chapel Hill where we totaled over 50 species, including some great warbler sightings (even a nesting Northern Parula). So, I am now spending time at home, watching the tree tops, and checking the feeders and garden area frequently for new arrivals. If I am in the mood for some photography, I will pull the car out to the garden and sit, window down, bean bag on the door panel, and watch. I placed some dead snags around the fence for perches and just added a water feature. 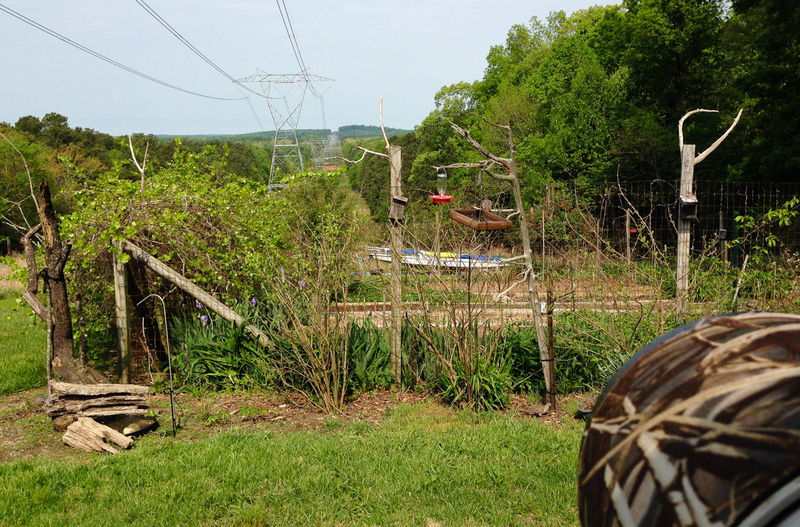 The diversity of plants, the cover provided by the grape vine growing along one fence, and the fact that this is an edge habitat, make the garden an attractive place for any passing bird to stop and check out. There is also a feeding station between the garden and a large plum tree (a favorite of the local birds due to its thick branching pattern and good cover). On most days, it is like a busy airport in this area with flights coming and going between the garden fence, the nearby woods, the plum tree, and the feeders. And this time of year you tend to get some international flights. Yesterday was a very good morning. The total for the day was 34 species, with 30 of those being seen in, or flying over, the garden in two hours in the morning. A complete list is at the end of this post. Over the next few days, I will post a few pictures of some of my favorite visitors. 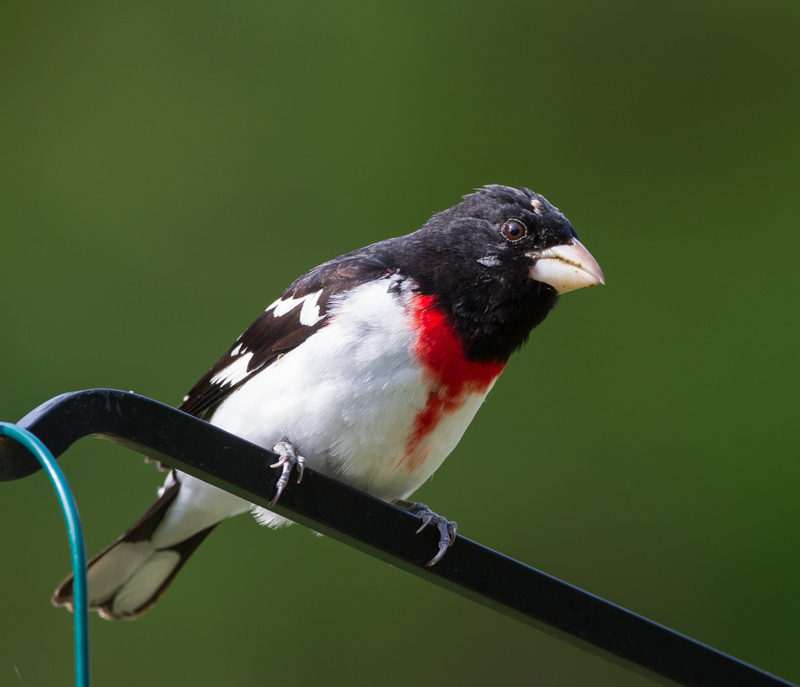 The bird that started it all on Monday morning, a Rose-breasted Grosbeak. 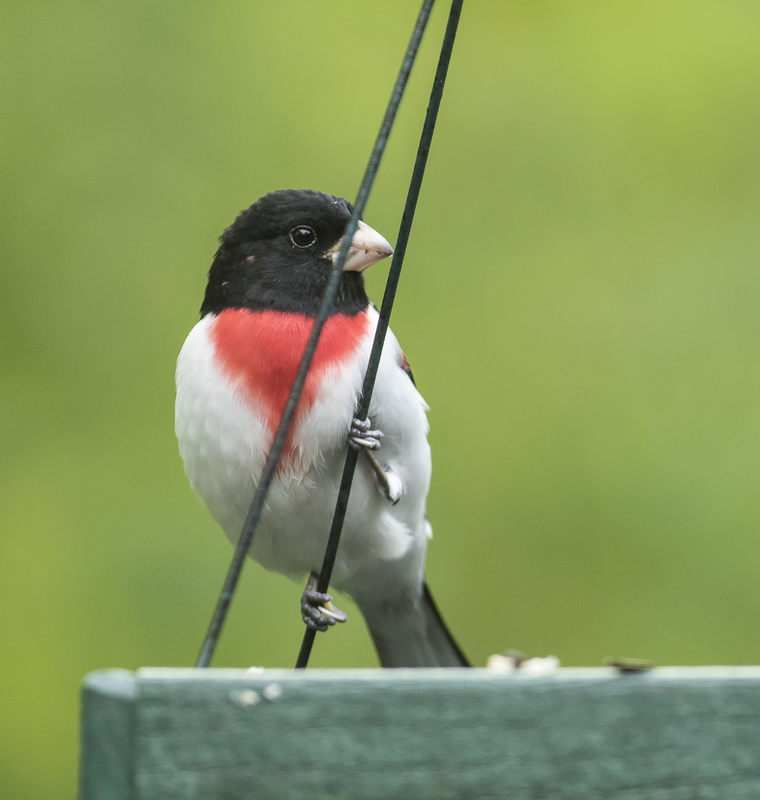 It all started when I got distracted from some household chore by a flash of color at the feeder outside the living room window – a male Rose-breasted Grosbeak. 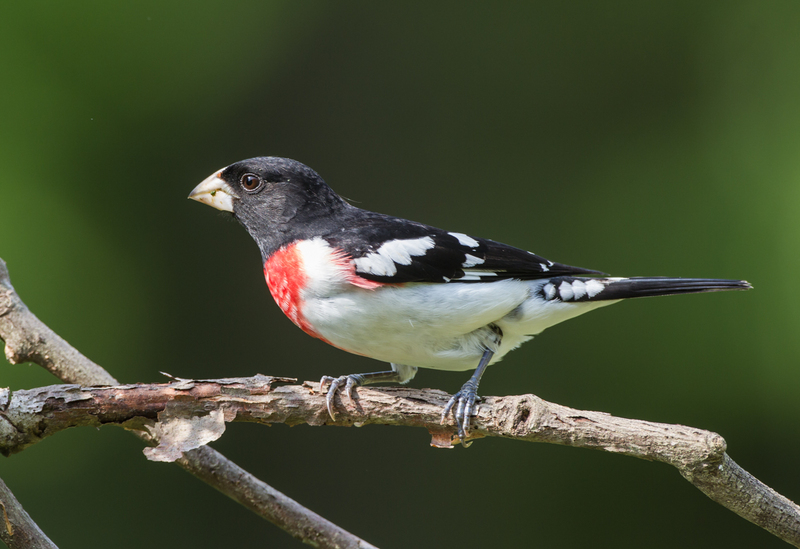 Certainly one of our most striking birds, Rose-breasted Grosbeaks nest in our mountains and hardwood forest further north, but pass through much of the rest of the state in fall and spring migrations to and from their winter homes in the tropics. They have been regular visitors at my platform sunflower feeders for many years for a couple of weeks in late April and early May. They are deliberate in their behavior and will often stay at a feeding station for a considerable period of time before disappearing into the tree tops. Then, it may be a couple of hours before they reappear, so I keep one eye on the feeders this time of year and hope to catch a glimpse of one. They are definitely one of those birds that cause you to stop whatever you are doing and pay attention. Their huge beak is well designed for crunching hard seeds (and bird banders’ fingers) so I was surprised to see one at my suet feeder near the garden. With the migration in full swing, I recently lashed a dead branch onto the feeder pole to provide a more natural perch for photography of any visitors. 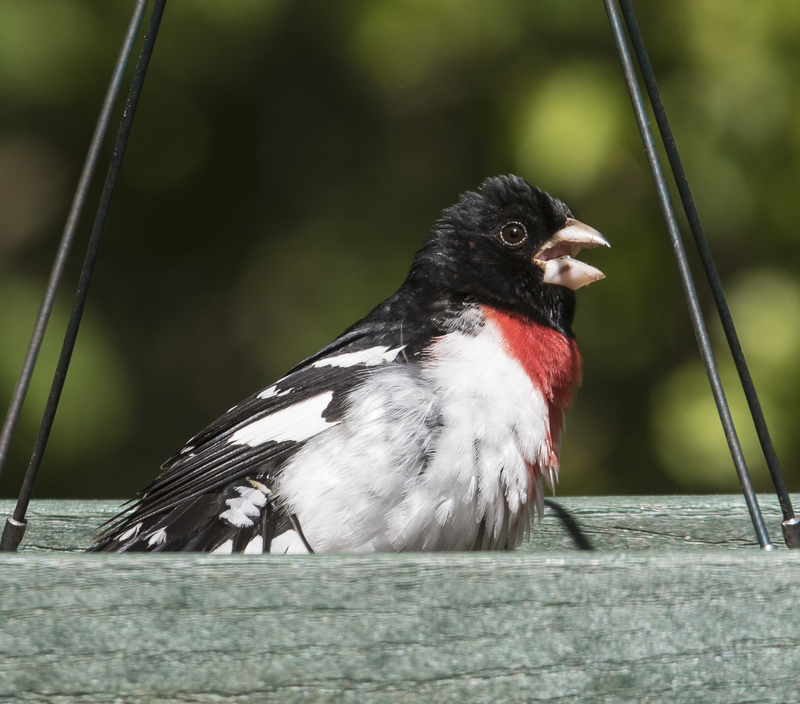 The grosbeaks took full advantage of it to chip away at the suet. While I was observing the one at the suet cage, another male landed and started feeding on an adjacent tube feeder with suet nuggets. You can see some differences in the plumage between the two birds – you can supposedly distinguish individual males by subtle differences in the shape and extent of their rose-colored breast and shoulder patches. After looking at the images I think I may have three different males – compare the first image at the platform feeder with the one above and below and look at the rose shoulder patches (or lack thereof) and the heads. The two males stayed with me for 20 minutes or so, feeding, and then both flew up into the trees. 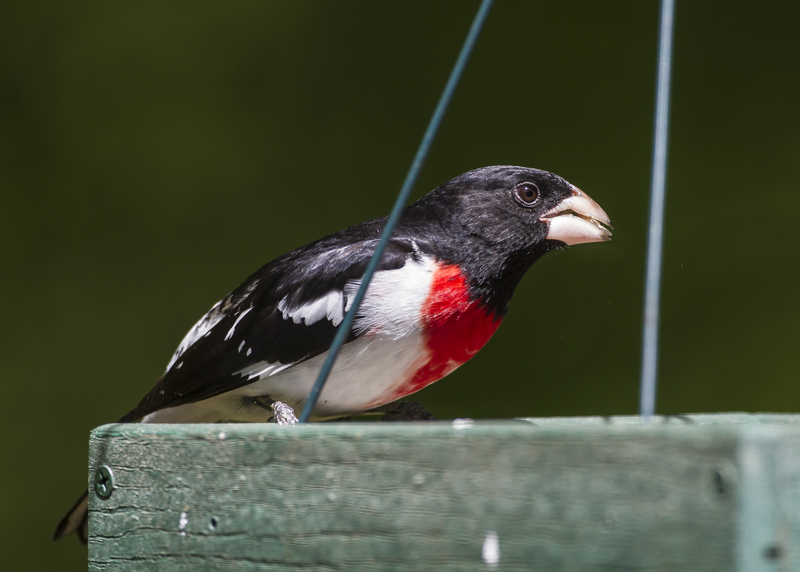 The grosbeaks did not reappear at this feeding station until much later in the day. But, I did hear their melodious song a few times from my woods off and on during the day. The song is somewhat like that of an American Robin, but richer in tone. 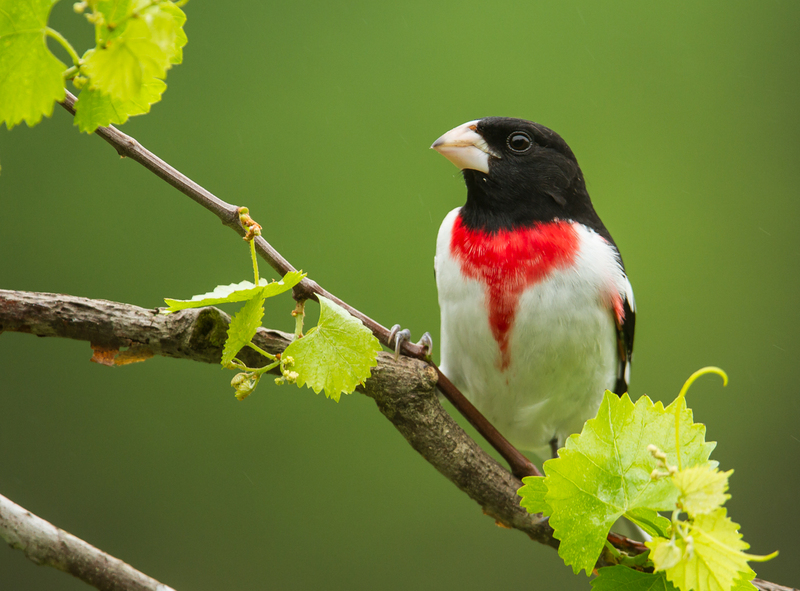 Thoreau stated that the Rose-breasted Grosbeak is our richest singer, perhaps, after the Wood Thrush (which was also calling from these woods early and late in the day). At one point, one of the males landed on a snag along the garden fence. He perched there for a couple of minutes, surveying his world, and helping me appreciate the beauty of mine. Make some time for yourself these next few weeks and get outside and catch some of the surprises of the season – it will be well worth it.